In those fondly remembered days when we lived on board our yacht Oasis in the Caribbean, one of our favourite visits was to the French islands Les Saintes. There we had a memorable Smoked Swordfish Tart at Le Genois. It is fairly unusual to find smoked swordfish or marlin outside of the Caribbean I think, but sometimes here I find smoked tuna slices, which fits the bill perfectly. I haven’t tried it with canned smoked fish, as the texture of fresh (or defrosted) is so much nicer. You can use smoked salmon or trout instead. 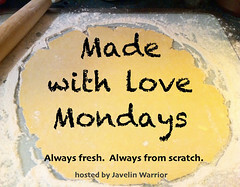 For a non-fast day, I made this with a wholewheat shortcrust base, but it would work equally well as a crustless quiche – just make sure that you use a really good non-stick dish or grease it really well. You can have 4 generous servings from your tart – it comes to 488 calories with the pastry version – but just 260 per serving for a crustless one, so that would be a lovely main dish for a fast day, to serve with a crisp green salad or steamed vegetables. The serving shown in the photo is just 1/6, at only 320 kcals. 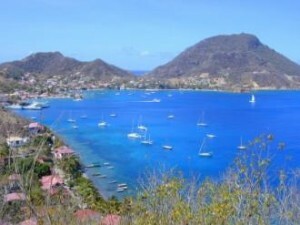 You can get a glimpse of the lovely islands of Les Saintes (and other delightful places) in my cruising journal. 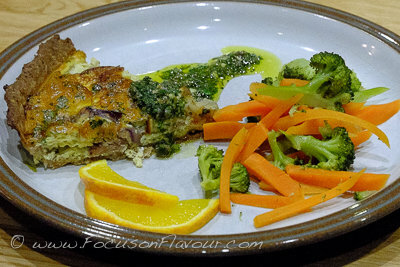 A delectable savoury tart which makes the most of a small amount of smoked fish. Served with an intense gremolata. Crumble the butter into the flour and salt and add enough water to make a dough. Preheat the oven to 160c while the dough rests in the fridge, wrapped in cling film. Roll out the pastry quite thinly and line the dish, then trim the edges. Bake blind for 10 minutes covered with paper and baking beans, then 10 minutes without. Lay the smoked fish evenly over the pastry (or directly into the dish if going crustless). Distribute the finely sliced onion over the top. Beat the eggs in a jug and top up to 300ml with milk (or milk and cream if you want it more luscious). Season and add chopped parsley then pour over the fish. Bake for about 30 minutes, until the egg is set and the top golden. Serve the tart hot, warm or cool, with the gremolata spooned over. As this has no cheese, it is easily adapted to be completely dairy free, using a good quality sunflower or olive oil based spread as an alternative to butter for the pastry. I use soya milk, but oat milk or dairy milk would both be suitable. The original gremolata was made with finely sliced spring onion, parsley and lemon zest, which is equally good. I had pastry left over from the above quantity - enough to make a couple of individual tart cases for another time. 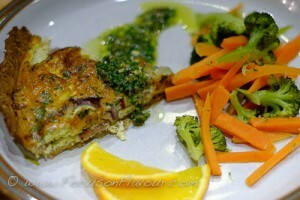 This entry was posted in Fish, Recipe and tagged crustless quiche, eggs, gremolata, smoked fish, tart by Belinda Berry. Bookmark the permalink.